Food is usually a big part of any trip that I take, so it’s no surprise that I’m blogging about the meals I had on my quick Indianapolis road trip. First, you need to understand that the purpose of this trip was to buy some chairs, not to have great meals. But I try to take advantage of the opportunity to explore any area, so I was looking forward to some good meals. We arrived at 10:30 AM on a Sunday, and by the time we finished buying the chairs and landing in an area where we could grab lunch, it was 1:30. 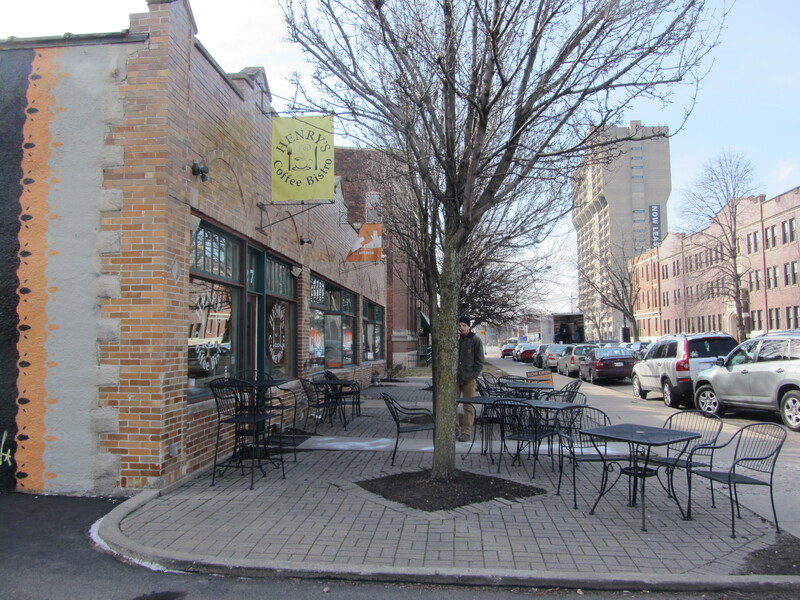 We weren’t that impressed with the area where we ended up, the Fountain Square neighborhood, but if we waited much longer then there would be no way we would be eating dinner. Looking around, we decided to give a BBQ place a shot that seemed interesting from the outside. I should have read the Yelp reviews for the Smokehouse on Shelby first. Caroline and I both ordered the pulled pork with sweet BBQ sauce. She picked the roasted apples and crinkle sweet potato fries. I went with the baked beans and mac & cheese. Caroline didn’t like the BBQ sauce at all…thought it was way too sweet. She asked for the chipotle version, but that was too hot. She ended up mixing them together and said it made it tolerable. I actually liked the sweet BBQ sauce pretty well. Not the best I’ve had, but far from the worst. We also disagreed on the pulled pork sandwich. I thought it had no flavor. The bun was good, and it was huge, but the pork was blah. She liked it though. I really liked my mac & cheese and my baked beans. I finished both and left some of the sandwich. We did get good service and a very helpful manager sat down with us and helped us pick out a hotel on my iPad. He reassured us that the theater we were planning to go was a good pick. It’s so nice to have an local’s respective and his help was very much appreciated! 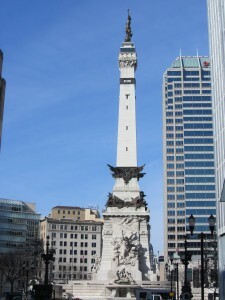 Would I go back the next time I was in Indy? I like trying new places and this place didn’t have the wow factor to send me back there instead of continuing to explore. 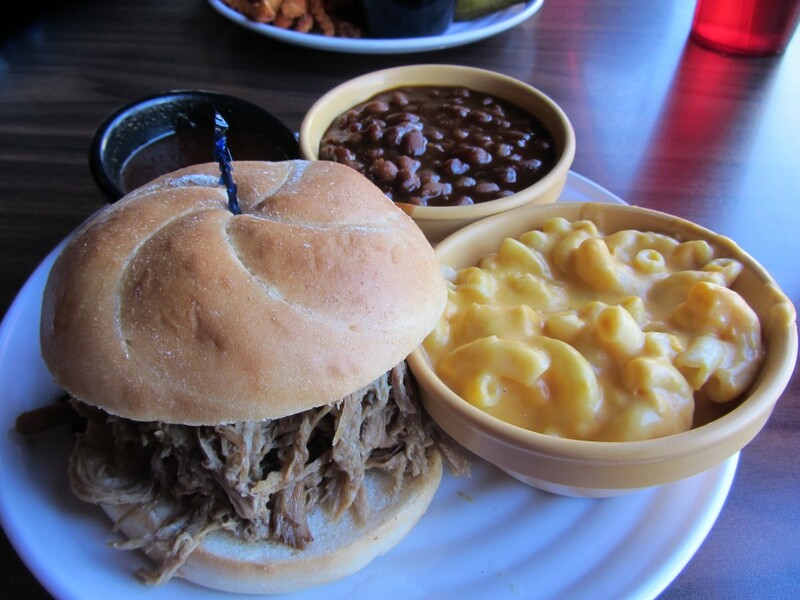 But if I did, I would try something different but definitely get the mac & cheese and backed beans as my side dishes. Our 5 PM show got out around 7 and we really weren’t hungry after the big BBQ meal, but we knew we needed to get something to eat. 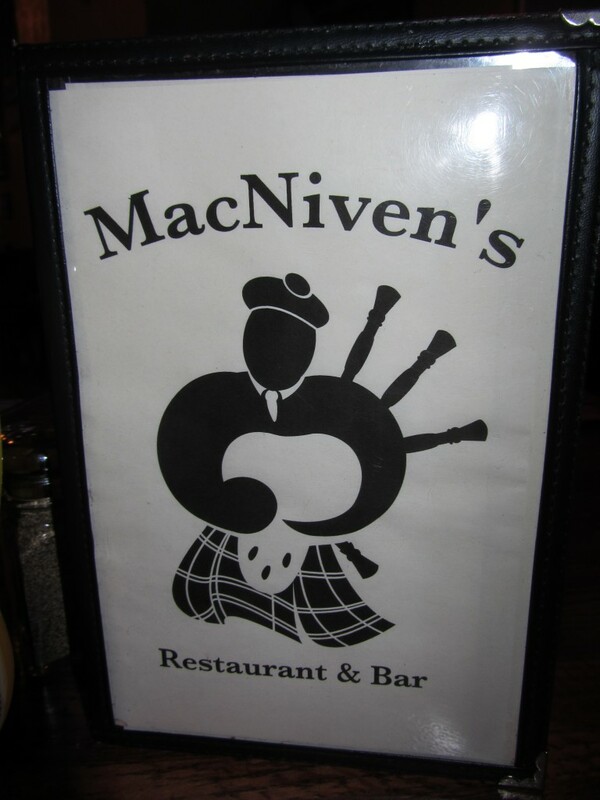 We took a walk down Mass Ave and ended up at MacNiven’s. To be honest, Scottish food isn’t my favorite. 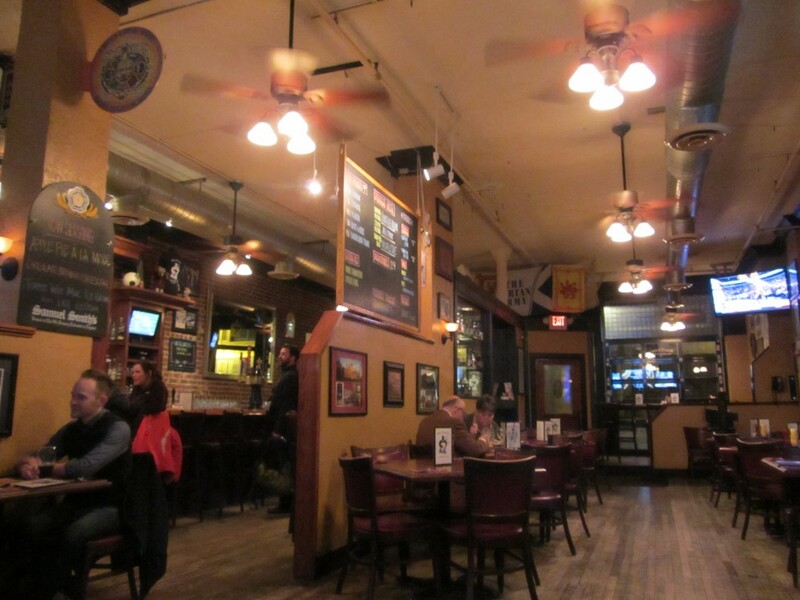 But I can find something on any menu and I loved the atmosphere so we gave it a shot. Yes, they were pretty empty. But it was a Sunday night. My guess is that this place is packed on other nights. The service was attentive and quick. After looking over the menu and not really being all that hungry, we decided to split a dessert for dinner. 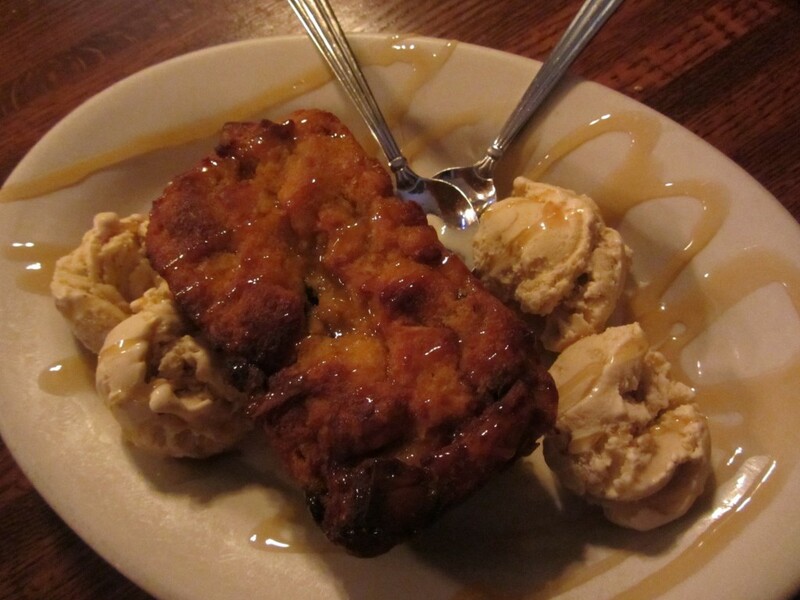 We ordered the bread pudding drizzled with caramel sauce and served with ice cream made especially for them. The ice cream comes from Lick’s Ice Cream and the waitress said it had something similar to beer in it. I wish I could remember the name of it. All I know is that this ice cream was AMAZING. Inside it had these crunchy nuggets that tasted like toffee to me. The bread pudding itself was ok…I like them a little more moist. I think the reason it wasn’t as good as some others is because it was made in it’s own mini-loaf pan…meaning it was all edges instead of an inside mushy piece which I prefer. Yes. I’d probably get a beer and a burger, and top it off with a scoop of ice cream. When you stay at a Bed & Breakfast, it comes with breakfast. We stayed at the Nestle Inn in the Mass Ave area. Since they only serve breakfast in their dining room on Saturday and Sunday mornings, we were given a voucher to go next door and get anything we wanted off the menu (up to $10 value) at Henry’s Coffee Bistro. We got there around 9:30 AM, and the pastry case was already pretty cleared out. There weren’t a lot of hot food options, so I ended up with a bacon, egg & cheese on toast sandwich. I’ve had better. Definitely wouldn’t order that again. That said, the lunch menu, while limited, looked good. If I ever go back and receive a breakfast voucher from the Nestle Inn, I’ll either try to get there earlier while the pastry case has a bigger selection or save the voucher for lunch. Yes, if I had a free voucher or was staying next door. Otherwise I would try someplace else. Bottom line…the food wasn’t the highlight of this trip. It wasn’t terrible, but none of the places we hit I could rave about. 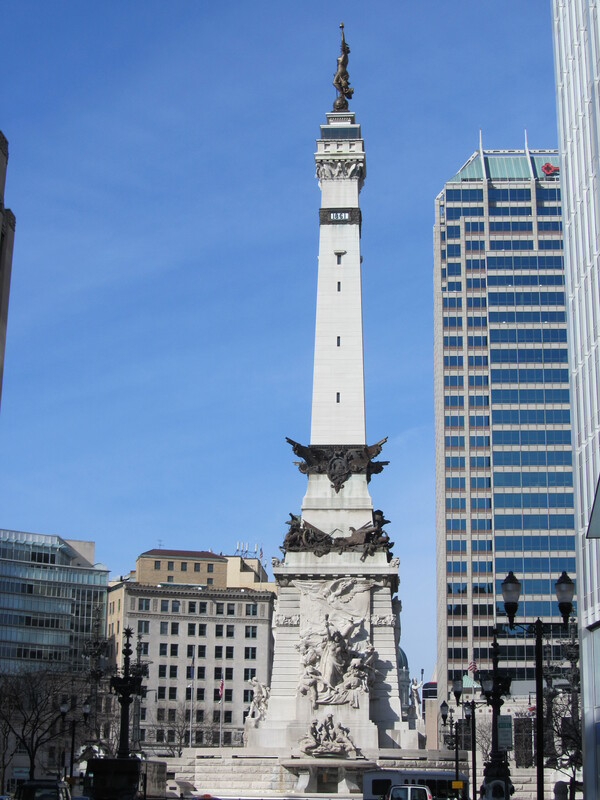 I know that Indy has some great restaurants. Next time I’m there I’ll do more research on Yelp before heading out for a meal.